Hello nail geeks! 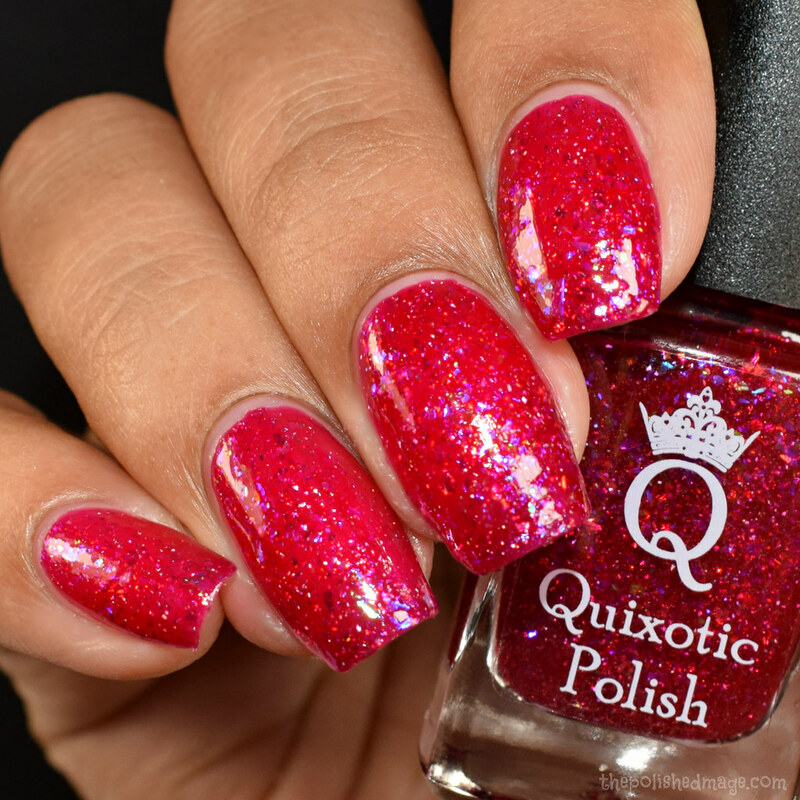 Today I bring you the holiday collection from Quixotic polish! There are four polishes and one topper in this set, and they are such gorgeous takes on traditional holiday shades! I was feeling a little extra so I actually arted for you guys too! Be sure to check out my swatch video for a quickie tuturial on how I arted as well as see these beauties in action! Serious beautimousness ahead! Swatches show one coat over a french style gradient. This topper has a jelly feel to the base and adds a dense scatter of various sparkles to your nails. In this entire post I went with one coat over the other polishes which I will notate as we go on. I had no problems getting the holo particles to spread on my nail and after topcoat my nails were smooth to the touch. Swatches show three coats with topcoat. This one has a somewhat lighter feel during application compared to the other two in the set, but build perfectly opaque on me at three coats. The base is a lovely light mauve/petal pink in my opinion and there is a strong golden shimmer. The holo effect is linear, and in person you can see tiny holo microflakes. I thought this shade was super flattering, and if there’s one color I love as much as blues and greens on my nails- it’ll be in the mauve family. No texture after topcoat. Swatches show two coats with topcoat. Formula has a medium feel and built up very easily for me. The base is a vibrant ice blue and on tilt you’ll see purple peek out. In bright lights the aqua creates a glowing effect, almost like a shimmer. You can see the purple saying hello in my macro shots below. The micro flakes give a scattered sparkle and the holo adds a lovely rainbow in the background. No texture after topcoat. Swatches show two coats with topcoat. Formula felt very similar to Mythic Icicles, easy opacity. This one is such a vibrant glowing type of green. You’ll see the frosty green base and a strong golden glow overall with a teal shift on angles. There’s a lot going on here, and it’s a wonderful take to the traditional holiday green we see this time of year. 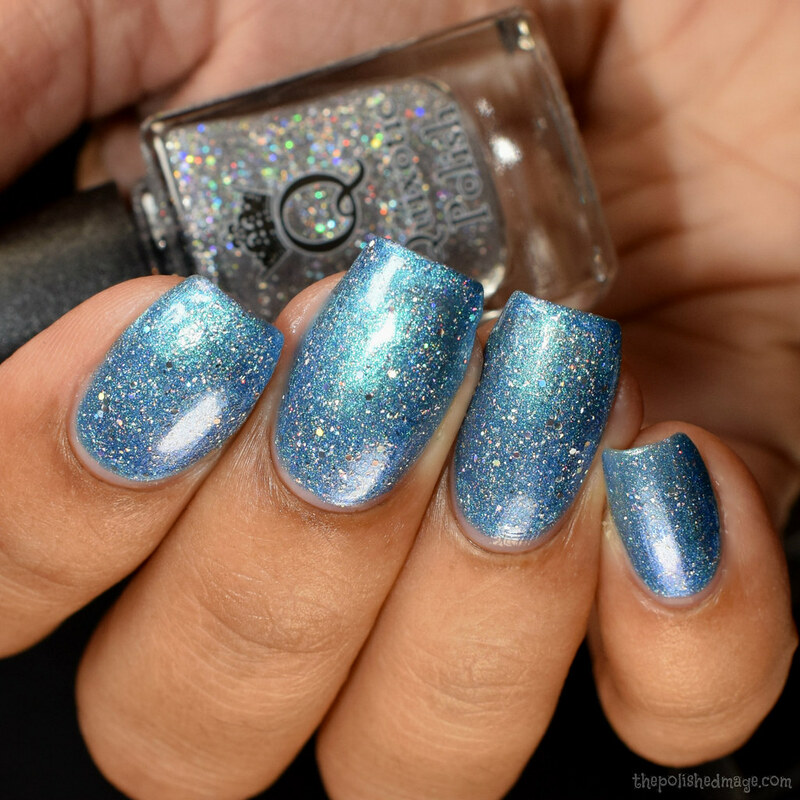 There’s a linear holo background and the holo microflakes give a scattered sparkle. No texture after topcoat. Also, that name is adorable. Swatches show two coats with topcoat. This one has a rich feel during application, like smooth liquefied jello. It beads easily on the brush so a little goes a long way, in my opinion. For a jelly type polish it build to opacity very quickly. The flakes behaved for me and gave a lovely pond effect through my two layers. Lots of sparkle and definitely one to check out the video to see it in action. I really don’t think my swatches did this one justice. No texture after topcoat.